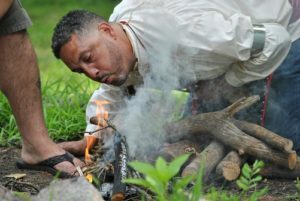 Little Bear Henries of the Nipmuc Nation lights a fire early in a pow wow event July 29. 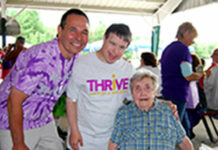 Grafton – The Nipmuc Nation hosted a pow wow celebration of their heritage on the Hassanamesit reservation in Grafton July 29. 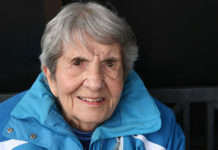 The pow wow in particular honored the community’s elders and ancestors. 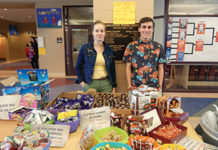 Taking place throughout the day, the pow wow featured vendors and celebrations from a small soundstage set up at the center of the community. Former chief Walter Vickers said the event has grown over his years involved in it, a fact he celebrates. While hosted by the Nipmuc Nation, Vickers said the event is an intertribal one, with guests from a variety of local communities. Held at Hassanamesit, the event is further special as the four acre plot of land is one of the few nearby pockets “never owned by the white man,” he added. Always existing as Grafton has grown around it, Hassanamesit celebrated proudly on July 29. “We’re just trying to keep our heritage,” Vickers said. 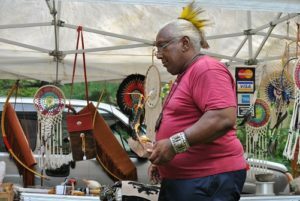 George “Lone Wolf” Thomas sets up his booth of collectables early in a pow wow event July 29. 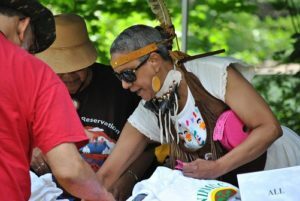 Raging River, a member of the Nipmuc Nation and the nation’s Elders Council, speaks with a customer at a booth selling tote bags at a pow wow event July 29.